Home » Uncategories » Should Use a Baby Walker for Babies? Should Use a Baby Walker for Babies? Should Using a Baby Walker for Babies - Some parents believe that baby walkers can help their baby's growth and development, especially helping children to be able to walk faster. However, is it true that baby walkers can help child development? Or even dangerous? Let's look at the pros and cons of baby walkers below. Is that a baby walker? Does your baby really need this tool? Baby walkers or baby walkers are objects that form a square, with wheels on each side below, equipped with a cloth in the middle as a baby's seat. Sometimes toys are placed on the top for babies or designed to put baby cups and plates. A baby walker is a device that is staying digging can help the baby run faster. When the baby is able to sit or stand tall, many parents buy this tool and hope the baby's walking ability will be faster. In addition, this tool can also be said as a child's toy. Why? The reason is, children aged 5 to 12 months will smile cheerfully when they are on the baby walker while shifting to and fro in the house. Even though he really can't really walk alone. The need for or not this tool actually depends on the needs and goals of parents using this tool for babies. To determine whether or not you need it, please look at the benefits and risks of using this tool. 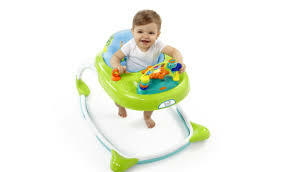 Baby walkers are generally designed with a busy look and use a lot of colors. It aims to attract the attention of children. The presence of a toy that is installed can also make a child sit quietly longer by using a walker. Many babies like and enjoy sitting, eating, or even watching television shows from walkers. By using a baby walker, parents also do not become too troublesome when feeding children. Because, when sitting on the walker, the child becomes calmer. The process of feeding or maintaining a baby also becomes easier because the child's body does not move too much and we can control it. Some studies show that the use of baby walkers does not help the learning process to walk. You can even make your baby lazy to walk. In addition, not all baby calf muscles are able to withstand the burden of walking. When parents force children to use a baby walker, this can make the injury even the risk of defects in the baby's feet. Keep in mind, that babies tend to use their toes when on a walker. This way of walking on tiptoes or using fingers will tighten their leg muscles and interfere with normal development. In addition, try to look after the baby comes out of the walker, chances are they still use their toes to stand or walk. In fact, the baby should walk and hold his body with all the soles of his feet, not just resting on his fingers. Fall from stairs. This is the case that most often results from using a walker. The ease of movement of the baby walker sometimes makes it possible to reach the end of the stairs, which if unattended, will lead to falls. Falling babies often experience broken bones and severe head injuries. Burnt. Using this tool can make it easier for babies to reach and reach something higher. For example, babies who walk into the kitchen can reach a teapot, food, or hot drink. They may also be easier to pull on the tablecloth, making objects on it overwrite the baby, including food or beverage containers that might have contents. In fact, other dangerous things, using this walker, babies can hold the stove, oven, socket or even dangerous objects that have electricity in it. Sinking. By using a walker, an unattended baby can walk out of the house (or another place that attracts his attention) quickly and risk falling into the pool or bathtub. Eat or drink foreign objects. Not infrequently, when assisted by a walker, the baby can reach or pick up objects and eventually put it in his mouth. Using this tool can increase the risk of choking on foreign objects and eating foods that are placed on the table in infants. Upside down. When tripping or bumping into something on the floor or in front of a child, walkers and children can risk falling over. In addition to the various risks that might occur, keep in mind that using this tool can hinder the ability to walk instead of helping it run fast. This is because walkers can disrupt the strength of the child's leg muscles. When using a walker, the leg muscles that become strong are only the bottom. In fact, the development of the leg muscles should be balanced with the hip and thigh muscles. As a result, instead of running fast, the upper leg muscles can weaken. So, is it better to use a baby walker or not? As discussed above, in fact, there are more dangers. The Pediatrics research journal in 2018 has also published that cases of child accidents in the US due to the use of baby equipment, such as walkers or jumpers, increase every year. It's good for parents to practice the ability of children to stand up and walk using other methods, namely by letting the child stand or freely move on the carpet specifically for babies or on the grass. When babies sit and stand up, that's when they are learning how to maintain their body balance. If you help using the process, the baby's ability to walk and stand in balance becomes less. There is no need to fear if the baby falls seated or rolled over while learning this standing and walking position. Freeing a child to move on the floor or carpet can also help hands and knees in all fours or pre-crawling. This is important to make the child's body become more weighty through the pelvis and shoulders. Instead of using a walker, Dr. Alan Greene, a pediatrician, speaker, and author of various books on child health science, as quoted on the website of his website, suggests other alternatives to help develop children's abilities when standing, namely with exersaucers. This object is shaped like a walker that has toys and seating, it's just not equipped with wheels. Exersaucers can make children jump, bounce, stand or even try to hold on to both sides of the tool while playing toys in front of them. This was felt by Dr. Greene is safer and more in line with children's development.